From Burger King’s hilarious Left-Handed Whopper to astronomer Patrick Moore’s gravitational alignment hoax, there have been some brilliant pranks celebrating April Fool’s Day. Yet while these jokes have been fortunate enough to have a huge budget and a wide range of resources to help create these famous jests, what pranks can you come up with that won’t break the bank? Fortunately for you, our creative couriers have dreamt up three funny and friendly letter pranks to pull for April 1st. All you’ll need are the usual writing implements, a bag of humour – and a willing victim…! 1. Hogwarts acceptance letters. Do you have any friends waiting patiently to hear back from a job interview or a university application? Do they also happen to be avid Harry Potter fans? Then they’ll love this prank – fake acceptance letters to Hogwarts! Turn their dream into a somewhat hilarious nightmare, by sending out faux correspondence from Hogwarts School of Witchcraft and Wizardry. Use your best fountain pens and own the art of fancy font with formal-looking letters, and prepare for your friends to praise you for your cunning prank (after all, who wouldn’t want to get accepted into Hogwarts!). 2. Gmail Paper 2.0. Remember that time when Google pranked the world with its most advanced technology to date? Introducing the innovative Gmail Paper – where Google offered to print every single one of your emails for you, pile them into a box then ship them straight to your door. Back in 2007, everyone fell hook, line and sinker for this imaginative idea – however, an imagination was all it was. But you have the opportunity to bring this dream to life, by choosing an unsuspecting person and printing off your entire correspondence and sending it to them in time for April Fool’s Day. Just ensure the emails aren’t too embarrassing, as the last thing you’d want is for your prank to fall in the wrong hands! 3. Ship your friends confetti. Remember the super brilliant and super sparkly concept of ‘Ship Your Enemies Glitter’? Well why not offer a toned-down version of this service in the form of sending your friends confetti? While it’s certainly a lot less messy than glitter, the surprise of receiving confetti will leave your friends stumped – unsure whether to celebrate or commiserate with this unusual delivery. What’s the best April Fool’s prank you’ve ever fallen for? Or would you say you’re the champion of April Fool’s jokes – where you’re renowned for your inventive and ingenious jokes? 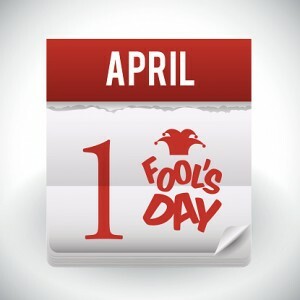 Tell us your top pranks in the comments box below – happy April Fool’s Day everyone!